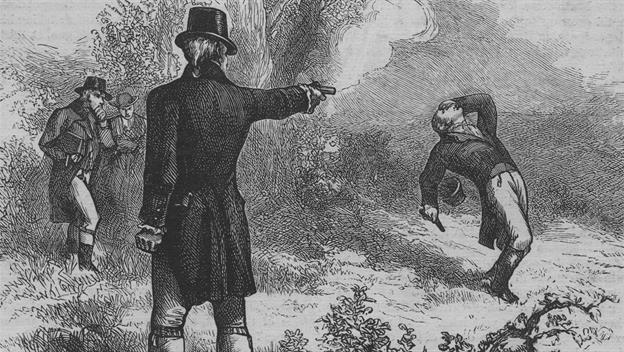 On July 11, 1804, former secretary of the Treasury Alexander Hamilton met Vice President Aaron Burr at Weehawken, New Jersey for one fateful duel. The two prominent politicians had been locked in rivalry for years at this point. In the end, Burr shot Hamilton, who died the very next day. Alexander Hamilton, born in the Caribbean, fought in the Revolutionary War and also served as an aide-de-camp to General George Washington. He played an instrumental role at the Constitutional Convention of 1787, and after it passed, served as President Washington’s Secretary of the Treasury from 1789-1795. Aaron Burr was born in New Jersey and also fought in the American Revolution. In 1783, he was elected to the New York State Assembly and afterwards, a state attorney. 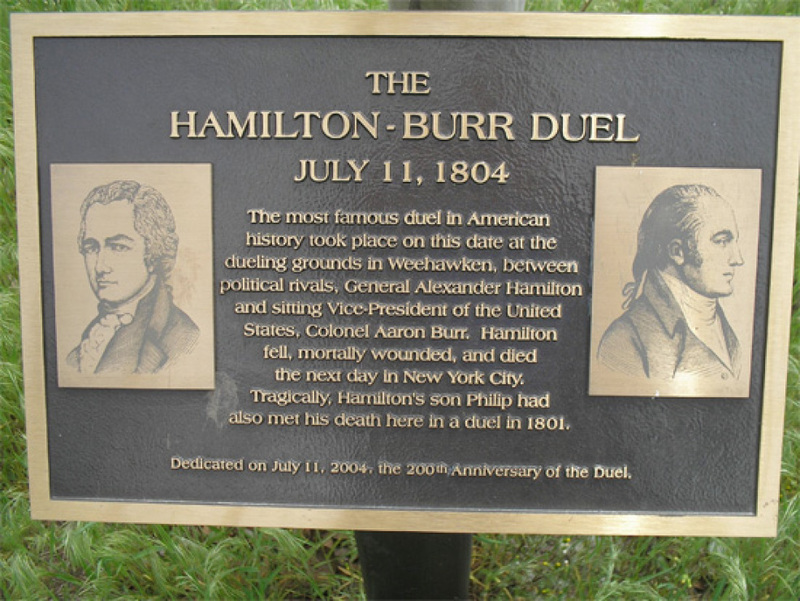 The rivalry between the two politicians perhaps first began when Aaron Burr defeated Hamilton’s father-in-law, Phillip Schuyler, in 1790 as Senator. Hamilton, over the years, grew to hate Burr more and more, often speaking ill of him to others. Six years later, Burr ran for President, Hamilton began publically attacking Burr. Then in 1800, Burr ran again, but against Thomas Jefferson. Though Jefferson and Hamilton had never been allies, during the election, Hamilton supported Jefferson over Burr. In the end, Jefferson won the presidency and Burr became vice president. When Burr, once more, ran again in 1804, Hamilton continued to campaign against him and make sure he did not win. 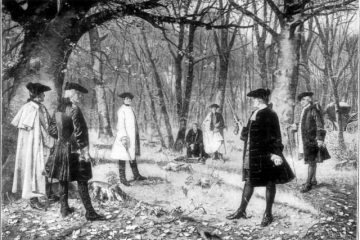 Because Hamilton had so badly damaged his reputation, Burr challenged him to a duel. It was early in the morning on July 11, 1804, when the two politicians rode on separate boats from Manhattan to the popular dueling spit of Weehawken, New Jersey. Though dueling was illegal in both New York and New Jersey, the latter was not nearly as aggressive when it came to punishing those involved in the duel, which was why they decided to hold it there. It was also where, three years before, Hamilton’s son Phillip had died in a fateful duel. At 6:30 a.m., they arrived and Burr’s second William P. Van Ness and John Swarthout cleared say the underbrush from where the duel was to happen. Right before 7, Hamilton arrived with his second, Judge Nathaniel Pendleton, and Dr. David Hosack. According to those who witnessed the duel, each man fired a shot, though it is unsure who shot first. Hamilton fired above Burr’s head, and Burr hit Hamilton in the lower abdomen just above his right hip. The bullet fractured his third or second false rib and damaged his internal organs, including the liver, badly. It ended up lodging in his first or second lumbar vertebra. Nathaniel Pendleton said that when Hamilton was shot, he immediately collapsed to the ground and dropped the pistol. His opponent moved towards him, speechless, Pendleton figuring he was filled with regret. Van Ness hurried Burr away as the rowers and Dr. Hosack approached Hamilton. Hamilton was then taken to William Bayard’s home in New York and Bishop Benjamin Moore gave him a communion. His wife, Elizabeth Schuyler Hamilton, and their children gathered around him when he died the following morning. More than twenty family members and friends were there when he passed. Hamilton was buried in Manhattan at Trinity Churchyard Cemetery. 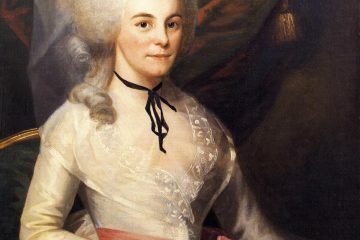 Many years later when his wife died, she was buried beside him along with her sister Angelica Schuyler Church. At the funeral, Gouverneur Morris, one of Hamilton’s political allies, gave him a eulogy and also set up a private fund for Hamilton’s children and widow. Though Burr was charged in both New Jersey and New York with murder, neither ended up going to trial. In November of 1804, a grand jury indicted him for murder in Bergen County, New Jersey. However, when the New Jersey Supreme Court quashed the indictment, Burr fled to Georgia to Saint Simons island. He returned to Washington, D.C. not long after to finish out his term as Vice President.